While permanent teeth have the potential to last a lifetime, decay or damage can create the need to extract some of the teeth. In other instances, the mouth is crowded and extracting teeth will help to prepare a patient’s mouth for orthodontics that properly aligns the teeth. Tooth extraction can also occur as a result of infection or even if there is a risk of infecting a particular tooth. The extraction of wisdom teeth and periodontal disease (gum disease) can also lead to tooth extraction. Here is a review of the extraction process and recovery period. Both oral surgeons and dentists can perform various levels of tooth extractions. The dentist will provide the patient with a local anesthetic prior to the extraction. This injection numbs the site of the tooth removal. If the tooth in question is impacted, then the dentist cuts away at the gum tissue and even the bone tissue that covers the tooth. A dentist will use forceps to grasp onto the tooth and move it back and forth so it loosens. Once the tooth is sufficiently loose from the ligaments and jaw bone, the professional will then extract the tooth. However, if the tooth proves difficult to remove, the dentist may need to remove the tooth in pieces. After extracting the tooth, a blood clot will likely form within the socket. The dentist then packs a gauze pad into the socket. The patient bites down on this pad to suppress bleeding. The dentist might also place some self-dissolving stitches to close the edges of the gums over the site of extraction. While the extraction of a tooth is quite safe, the procedure has the potential to let harmful bacteria into the patient’s bloodstream. Gum tissue can also become infected. A patient who has a condition that puts him or her at a high risk of severe infection might need to take antibiotics prior to and after the extraction. Patients should report their full medical history, medications and even the supplements they take to the dentist/oral surgeon prior to the extraction. The recovery period lasts a few days. If the pain is too great, then the patient can ask about taking painkillers. It helps to gently bite on a gauze pad to minimize bleeding and spur the formation of a clot within the tooth socket. Leave the pad in place for the amount of time advised by the dentist. The application of an ice pack to the affected site will help minimize swelling. 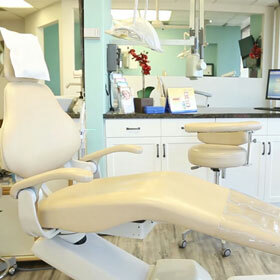 Patients are encouraged to relax for at least a full day after the tooth extraction. Do not rinse or spit in the six hours following the extraction so the clot remains intact. Refrain from smoking as it can prevent healing. Consume soft foods like yogurt, jello, pudding and soup for a full day after the extraction. Solid foods can incorporate as the extraction site gradually improves. Call Vanek Dentistry at (714) 545-7157 for more information or to schedule an appointment.